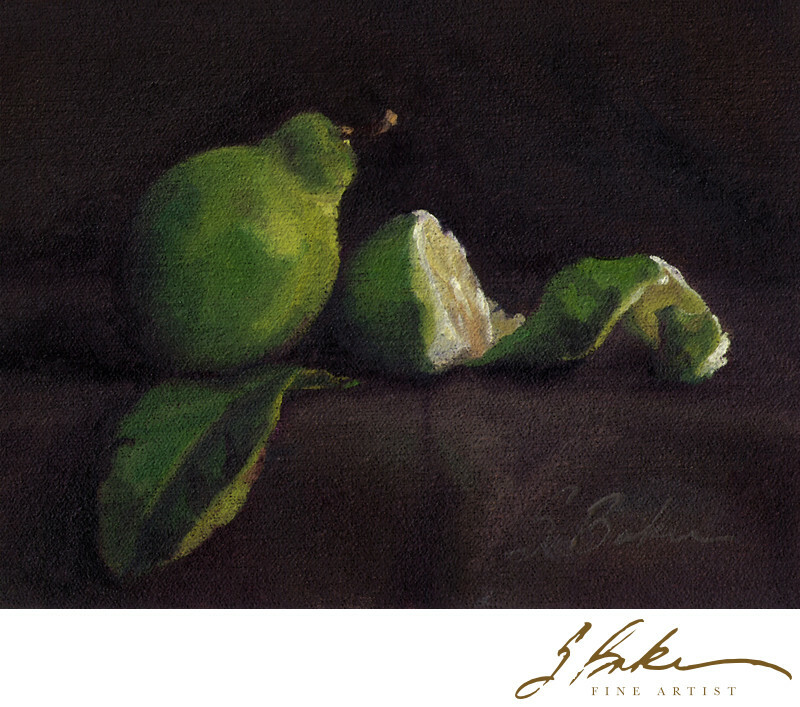 This is a simple little still life of a lime and a half. Even simple still lifes take time and thoughtfulness to set up and light. Compositionally, I put a good deal of effort into the placement of the three elements. The lean and direction of the stem of the whole lime directs the viewer's gaze into the central light of the cut face of the half lime, whose spiral peel pulls the eye to the right then back again to the fabric fold and bent leaf. In a painting, the viewers eye tends to go initially to the point of highest contrast and sharpest edge, with the exception of portrait paintings when the viewer is predisposed to look at the eyes. The initial focal point in this painting resides in relationship between the leaning and cut lime. I had a friend who would call the center of interest in a painting the “main squeeze," a funny little analogy, particularly appropriate in this painting. The “main squeeze” here is ready to be juiced.